Roy Moore reportedly known to cruise hometown mall for high school girls . 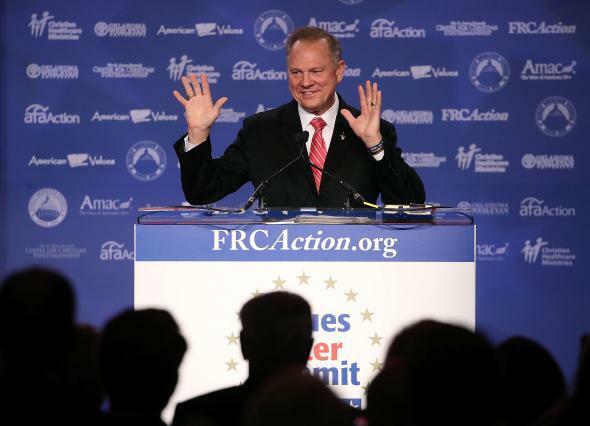 Roy Moore speaks during the annual Family Research Council’s Values Voter Summit at the Omni Shorham Hotel on October 13, 2017 in Washington, DC. Adding to the pile of disturbing accusations made against Alabama Republican Senate candidate Roy Moore is the apparent open secret in his hometown that the one-time chief justice of the Alabama state Supreme Court used to cruise the local mall in Gadsden, Alabama looking to flirt with and sometimes pickup high school girls. Moore was in his early thirties and the county assistant district attorney at the time. Moore’s conduct got to the point where it was creepy enough he was commonly known at the time to have been banned from the mall, according to more than a dozen interviews with members of the community conducted by the New Yorker. The original Washington Post story outing Moore last week for his alleged relationships with teenagers first described the Gadsden mall as a place that Moore not only frequented, but used to pick up dates. [Moore] often walked, usually alone, around the newly opened Gadsden Mall—6 feet tall and well-dressed in slacks and a button-down shirt, say several women who worked there at the time… Gloria Thacker Deason says she was 18 and Moore was 32 when they met in 1979 at the Gadsden Mall, where she worked at the jewelry counter of a department store called Pizitz… She says that Moore would pick her up for dates at the mall or at college basketball games, where she was a cheerleader… Around the same time that Deason says she met Moore at the jewelry counter, Wendy Miller says that Moore approached her at the mall, where she would spend time with her mom, who worked at a photo booth there. Miller says this was in 1979, when she was 16. She says that Moore’s face was familiar because she had first met him two years before, when she was dressed as an elf and working as a Santa’s helper at the mall. She says that Moore told her she looked pretty, and that two years later, he began asking her out on dates in the presence of her mother at the photo booth.